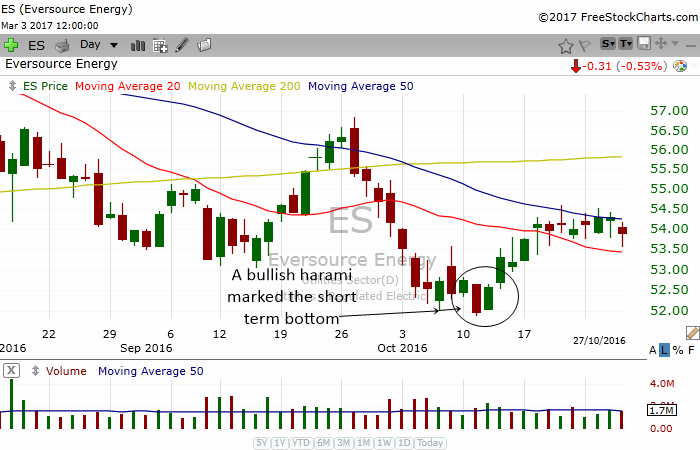 The bullish harami candlestick pattern is a powerful reversal candle when it happens at support areas. Combining this pattern with indicators will also offer a great signal. The pattern is a great reversal signal because of the sudden bullishness that come in after a drop in the stock. This tells us the bears are getting weaker and the bulls are gaining control. 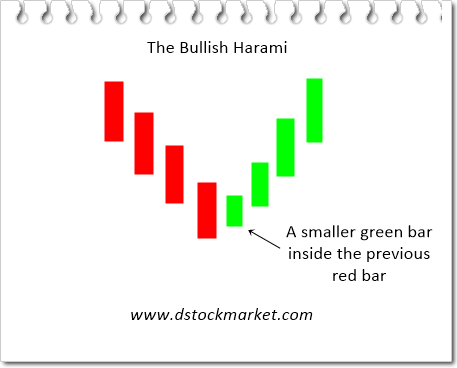 The bullish harami is often found after a period of bearish moves in the stock. The stock will decline day after day and then suddenly a green bar will form with its body inside the body of the previous red bar. A little gap up above the previous close is a sign that there is bullishness in the stock. The gap up often creates a little surprise for the bears and many will cover the shorts. The green bar will not close above the high of the previous red bar but it already tells us that a reversal it at hand. When the 3rd bar closes above the highs of the red bar, it is a confirmation of the pattern. Traders can often buy the stock for a quick swing trade. The presence of a bullish harami already creates a big psychological change in the mindset of market participants. When the candle pattern forms at a support area, it is a powerful reversal signal that you should not ignore. The chart above shows how a bullish harami pattern works. ES had already declined for many days and look set to continue lower. Then, a bullish harami pattern formed and changed the psychological mindset of market players. The stock had a quick rally in the next few days. In the chart above, ESRX had a break down. By right, the stock should move lower and continue the downtrend. However, the next day the stock gap up and formed a bullish harami. This of course changed the mindset of market players who were expecting a break down and continuation of the downtrend. When the stock broke above the highs of the red bar on the 4th day, this confirmed the bullish harami pattern. Eventhough the bears tried to push the stock lower, the bullish harami already did damage to the break down. It caused what we called a failed break down. When patterns fail, the stock often reverses direction and move in the other direction. In the case of ESRX, the presence of the bullish harami and failed break down actually started a new uptrend in the stock. 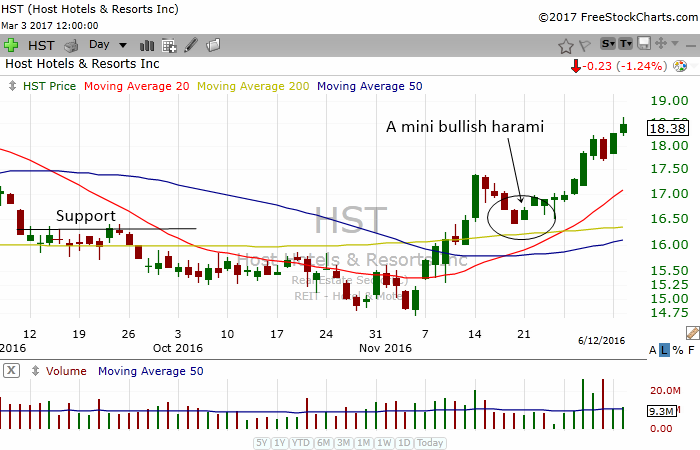 HST is a good example of how a bullish harami that forms at support can be a powerful reversal signal. As you can see in the chart above, HST was showing the signs of a new uptrend. It had a powerful rally in early November. Then a correction happened for a few days. The stock formed what I called a mini bullish harami at a support area. 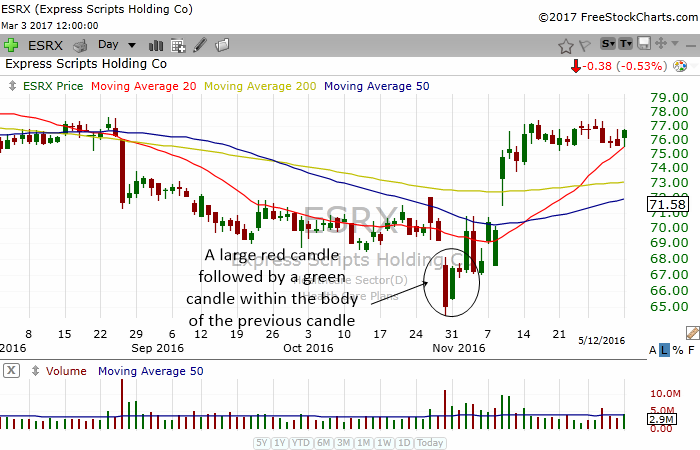 Sometimes in reading candle patterns we must be a little flexible and not rigid. When the stock gap up above the pattern the next day it confirmed the bullish harami pattern. This provided a signal for swing traders to jump in for a long trade. Sometimes a bullish harami pattern can end a move and start a new uptrend in a stock. 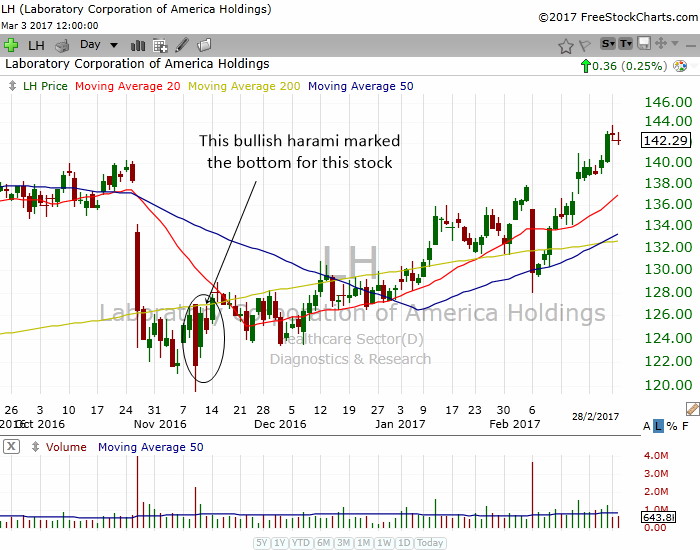 The chart above of LH shows how this stock experienced a big gap down which eventually caused the stock to move as low as $120. A big red bar formed and then the next day, the stock gap up and formed a bullish harami pattern in the stock chart. The bullish harami happened at the 200 day moving average which can act as a powerful psychological support provided traders with a potent reversal signal to the upside. In fact this pattern ended the bearish move and started a new uptrend in LH. The stock slowly drifted higher. I always emphasize the importance of combining price pattern with indicators. When you have price being confirmed by indicators, you have a very powerful trading signal. The chart above is the chart of MNST. This stock experienced a sharp gap down. The stock tried to rally but fell again till mid November. Then a bullish harami pattern formed. The presence of the bullish pattern already gave us a potent reversal signal. 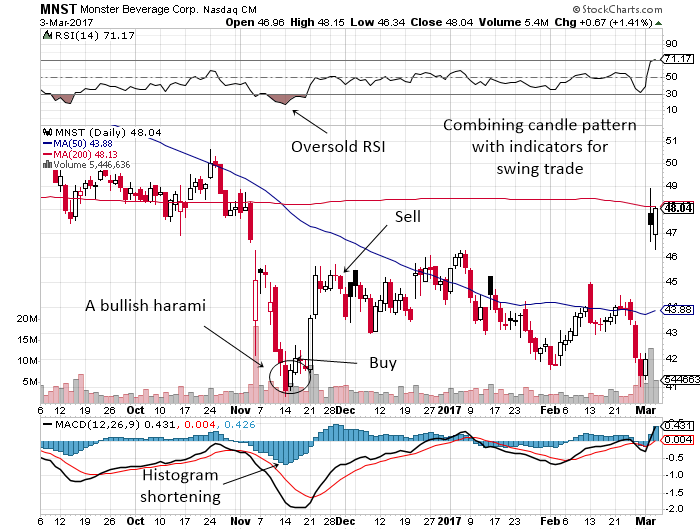 You can check with other indicators to see if the stock can give you a swing trade. One look at the RSI told us that this stock was extremely oversold. The MACD Histogram was forming a valley and has slowly started to shorten. This told us momentum to the downside has slowed down. Traders could have bought the stock when it traded above the highs of the red bar. The stock provided an excellent swing trade for observant traders.